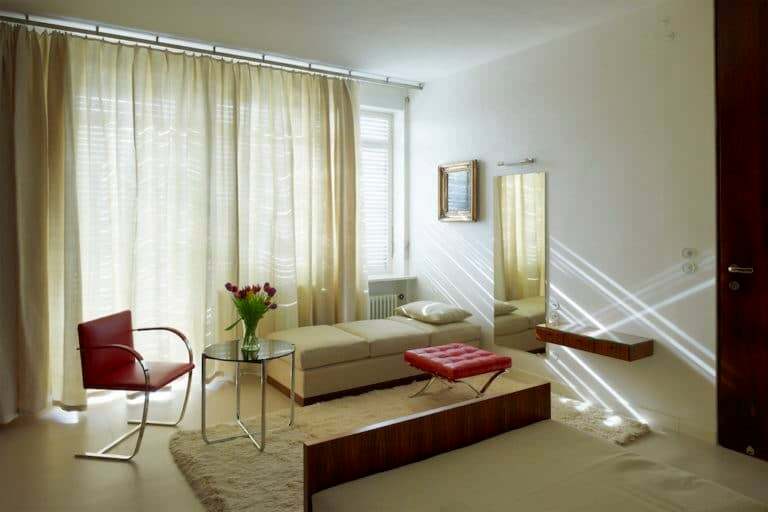 At Villa Tugendhat in the Czech city of Brno, Mies van der Rohe created some of his most iconic furniture pieces. Along with its then-unprecedented construction system, the materials used-Macassar Ebony, Palisander-are rare and exotic. The technical facilities-with heating, cooling and retractable windows-remain exceptional even for a contemporary house. 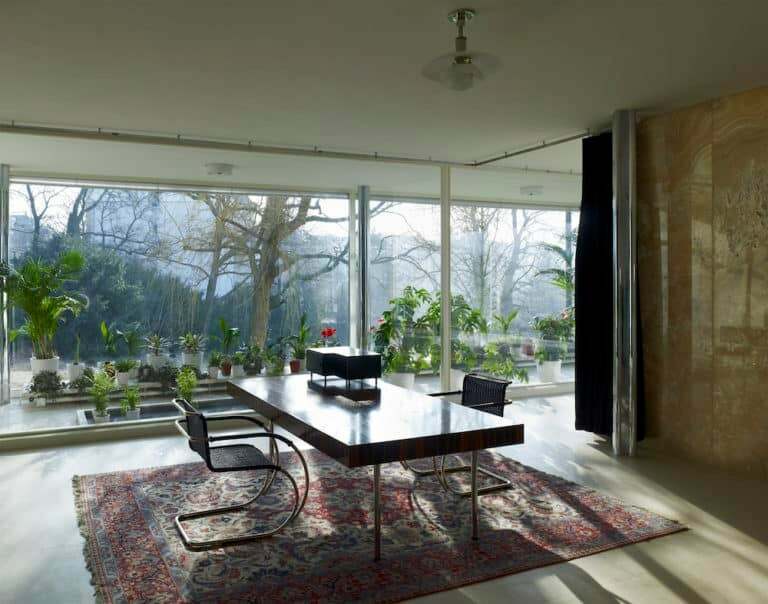 While designing Villa Tugendhat, the visionary architect also created some of his most iconic furniture pieces. On New Year's Eve 1928, Ludwig Mies van der Rohe presented the completed plans for a villa he was commissioned to design for a newly married couple in the Czech city of Brno. Grete and Fritz Tugendhat, both locals from affluent German-speaking Jewish families, were intrigued by a series of crosses they saw on the architect's floor plan. "For the first time in the history of architecture, a steel supporting structure in the form of cross-shaped columns was used in a private residence," says architect Iveta Cerna, "which Mies van der Rohe used to create a unique spatial concept of the interior." 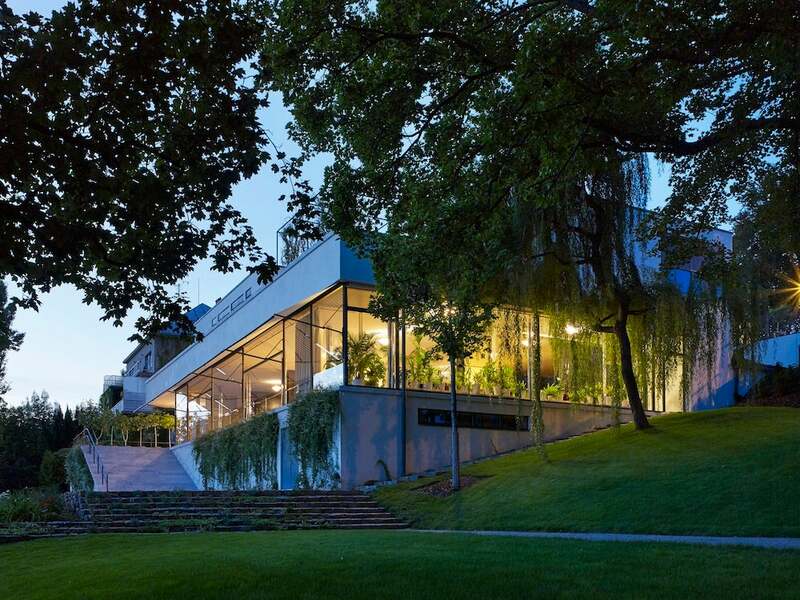 Today, Cerna is the director of Villa Tugendhat: the couple's commissioned home and now one of the Czech Republic's 12 UNESCO heritage sites. "There are many reasons why the house remains relevant even 87 years after its construction," Cerna says. 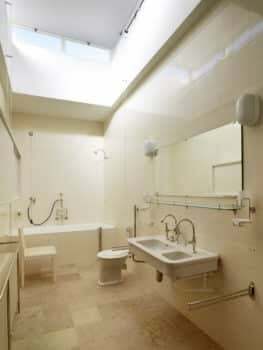 Along with its then-unprecedented construction system, "the materials used are rare and exotic. Also worth mentioning are the technical facilities, which remain exceptional even for a contemporary house. 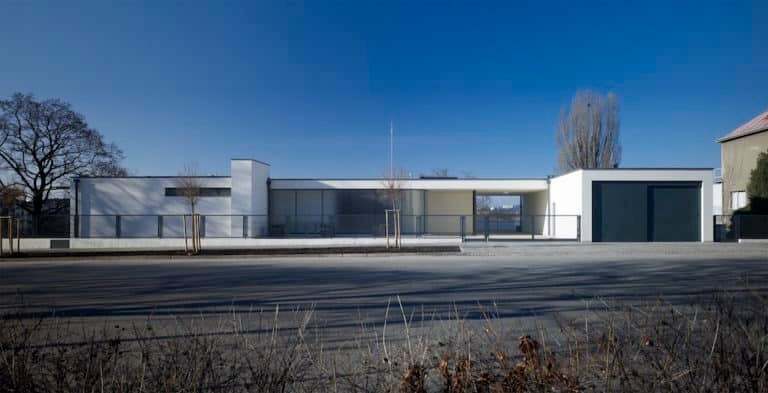 Last but not least, the story of Villa Tugendhat and its destiny throughout history is also why many people want to see this unique piece of architecture." Unassuming, yet striking from its street-facing side, the three-level villa sits on a sloped plot that was part of Grete's parents' Low-Beer Villa property. Following Grete's marriage to Fritz, her father gifted the upper-level portion of the land to his daughter and financed the home's construction. Grete had come to appreciate Mies van der Rohe's work while living in Germany, during her first marriage. The architect gladly accepted the commission, appreciating the site's exclusive position and expansive views of the city. Sadly, the couple's time inhabiting the home with their three children was short lived. In 1938, just eight years after they took up residence, they were forced to emigrate. Seized by the Gestapo in 1939, the home then became property of the German Reich in 1942. It suffered structural changes and then massive damage in 1945, when it was occupied by a cavalry unit of the Red Army, who used the main living area as a horse stable. The main living area's massive glazed windows were also broken as a result of pressure waves from air raids. The freestanding furniture was removed and the curved Macassar ebony partition went amiss. 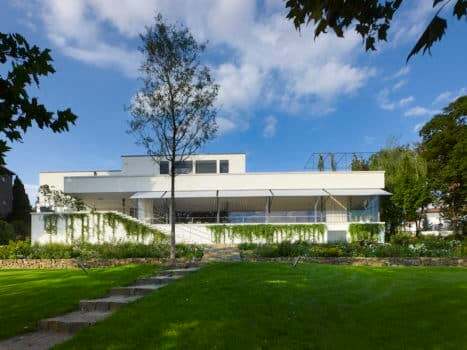 Villa Tugendhat underwent its first significant reconstruction effort in 1980, but it wasn't until a meticulous renovation project between 2010 and 2012 that the home was sensitively restored to its original state. Today, visitors travel from all corners of the globe to see Mies's masterpiece, which includes a flowing spatial plan, impeccable attention to detail and an emphasis on indoor-outdoor living. Before you have the chance to see Villa Tugendhat for yourself (which needs to be booked months in advance), here's a tour of some of the highlights. The entrance hall is paved in Italian travertine floors and features a rounded milk-glazed wall that bathe the space in natural light. It's truly a "wow" moment to descend the spiral staircase from the entry hall. Villa Tugenhdat's 2,550-square-foot main living area is the center of the home and where Mies's flowing arrangement is fully realized. Divisions of space are loosely created by the curved Macassar partition and the veined onyx wall. The latter, mined in Morocco, was preserved thanks to an architect who occupied the house in the 1940s and had the foresight to cover it in brick. 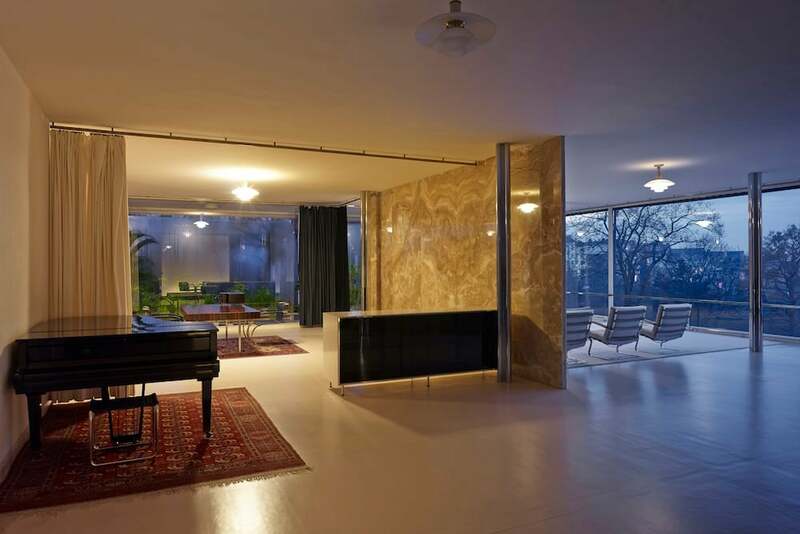 The thoughtful placement of the freestanding furniture — the majority of it tubular or strip steel and designed by Mies in collaboration with Lilly Reich, his partner between 1925 and 1938 — also contributes to the flow. The striking wall of windows defines the home's connection between interior and exterior, and the famed chrome-clad steel columns go beyond function to add another element of interest to the stunning space. In front of the onyx wall, two Barcelona chairs and a Barcelona stool are upholstered in green (a departure from the typical black and white) to mimic the exterior surroundings. 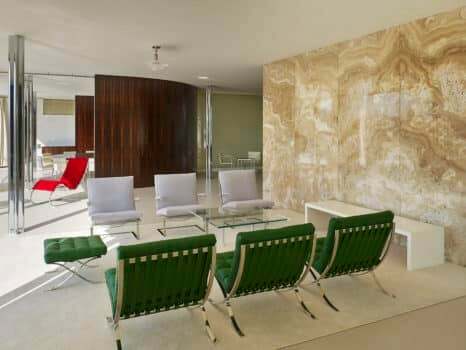 A trio of silver-gray Tugendhat chairs — one of the chairs designed specifically for the home — sit just across from them. Also part of the Barcelona series, which Mies created to furnish his German Pavilion for the 1929 Barcelona International Exposition, the red chaise longue adds a pop of color. The seven floor-to-ceiling windowpanes are the exact copies of the 1930s originals, including the two fully retractable windows, further blurring the distinction between indoors and outdoors. The rounded Macassar partition is the star among the home's use of exotic woods. Its panels, which disappeared from the main living room in 1940, were later discovered in the cafeteria of the Faculty of Law at Brno's Masaryk University. where the Gestapo had its base during the war. After more than 70 years, these elements were returned to their original place. 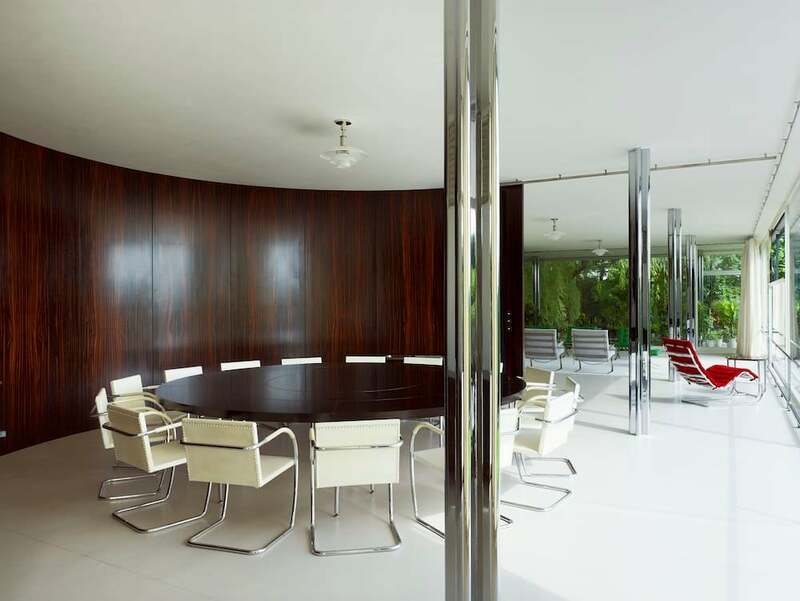 The partition follows the shape of the Mies-designed polished pearwood dining table and its set of 15 white leather Brno chairs, which were designed specifically for the house. 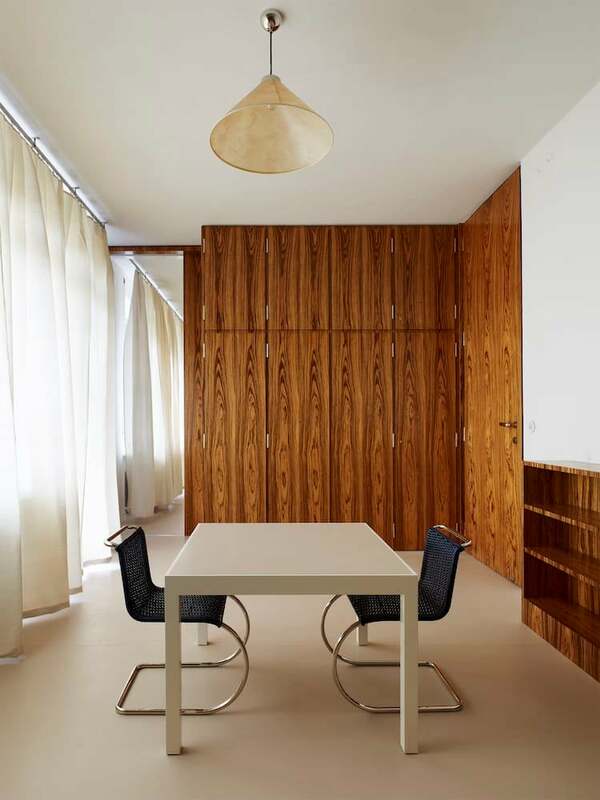 Behind the onyx wall and next to the adjoining winter garden, the study and library includes a Tugendhat chair in peach leather and two woven MR20, or Stuttgart, chairs at Fritz's desk. The MR20, also in the entry hall and in the nanny's room, was created for Mies's contribution to the Weissenhof housing estate in Stuttgart. The built-in bookcase, featuring the original panels (its shelves, with the exception of one preserved original, were made in the exact replica) is veneered in the same Macassar ebony as the dining room's partition. 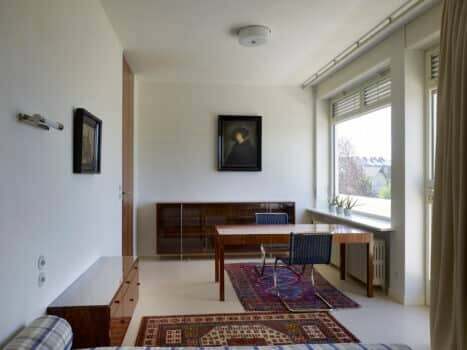 Strong materials, a few key pieces and an indoor-outdoor connection are the defining details of Mies's starkly simple bedroom design. "Less is more," he famously said. Next to Grete's daybed is a Brno chair and Barcelona stool, both upholstered in red leather. Original built-in wardrobes are veneered in palisander, as they are in Fritz's bedroom just past the couple's adjoining bathroom. The children's rooms, including Hanna's (Grete's daughter from her first marriage), feature zebrawood veneered built-ins and the same austere design as their parents' bedrooms. Designed to be purely functional, the starkness of these spaces comes as a bit of shock compared to the second-floor main living area. 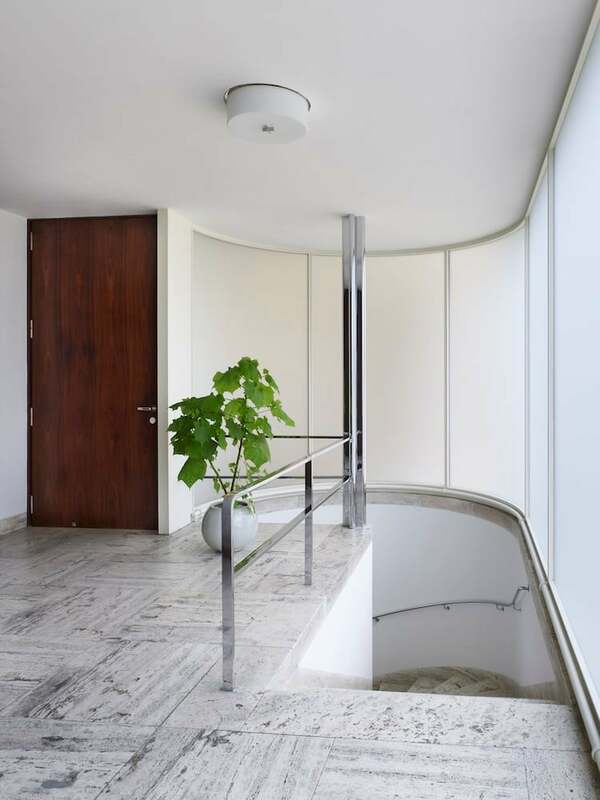 Even the technology was ahead of its time at Villa Tugendhat. "In the 1930s, the villa was already equipped with hot-air heating and cooling, and electric retractable windows," Cerna says. 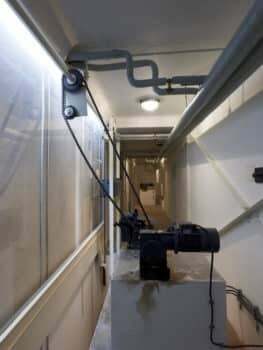 Along with the machine room, which served to open and close two windows in the main living room, the lower-level utility rooms included a storage space for Grete's fur coats and a dark room for Fritz's photography passion. Where the front side of the house was designed for privacy, the southwest-facing side opens up to the view. A set of travertine stairs lead down to the garden, which was designed as an open grassy meadow and features a large weeping willow tree. The view from the terrace looks out to Brno's Spilberk Castle, important cathedrals and churches and even the site of Adolf Loos's birthplace. Greenery grows up the side of the home, fully immersing Villa Tugendhat in its surroundings. The MasterLiving Blog. A MasterBlog. Simple theme. Powered by Blogger.